The second day of the competition was at least as much fun as the first. We actually got to spend some time getting some code to work. By the end we had some sensors sort of working and Amazon Echo behaviours that responded to commands for our application. And we also had a good plan for developing and deploying the application. We still didn’t win though. Mainly because the winning solution (and, to be honest, quite a few of the other 12 entrants) was quite a lot better than ours. 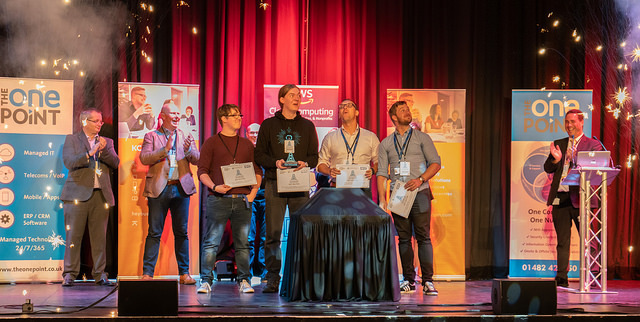 The winner, which started with the idea of giving everyone in a care home their own Amazon Alexa device, moved on to develop this in lots of interesting ways, and ended up with a fully working demonstration application, was just wonderful. It was chosen as the best by both the judges and the “People’s Choice Award” which was marked by all the teams present. Thanks so much to the councils and healthcare organisations that put the event together. It was a wonderful occasion and I hope that it will be repeated some time in the future. I also really look forward to seeing some of the ideas that were presented going forward to do good. One of the most impressive things to me about the whole competition has been the commitment of everyone involved to get the ideas into action. I’m really looking forward to seeing this happen. From one fun event to another. Now it’s time for a bit of hacking. The Humber Care Tech Challenge started bright and early today. I’ve been involved with some of the organisation of the event. It’s one thing to sit in a meeting making plans and trying to think all the things that could go wrong so you can fix them in advance. It’s another thing to walk into Bridlington Spa Hall and see lots of teams set out and getting started on their solutions. The level of enthusiasm and commitment at this event is astonishing. From the organisation group, who are trying to do something different to move things forwards to the healthcare professionals who have engaged with teams in a really positive way, to the teams themselves, who were quietly getting down to the business of making something awesome. I was there with Robin and Keith thing to come up with something. Keith had done his homework, and had arrived with a fully formed solution that he wanted to run past the Subject Matter Experts at the event. Robin and I did a bit of planning and then came up with an exercise aid that tried to recreate the atmosphere of “A Good Walk” for people who have difficultly leaving home. We played with some ideas and sensors and the Amazon Echo that we’d been assigned and, by judging time we had an idea that we thought stood up rather well. We didn’t win a prize. But I’m looking forward to finding out who wins tomorrow when the solutions are demonstrated. Enter the Humber Care Tech Challenge. Now. The Humber Care Tech Challenge is in just around a month. We had the Visioning day last week and we've now got 98 ideas for projects for you to explore. I've been through them and broken them into categories to make it really easy to identify challenges and ideas to explore. Last week I discovered, to my great delight, that we'll have Principle ICT Business Analysts from East Riding of Yorkshire Council along with developers from Amazon present at the event to help you build your solutions. I'm also working on getting the healthcare professionals behind the 98 ideas along as well. If I was a developer looking to get into the healthcare space I would regard the chance to meet up with people like these as priceless. And you only have to pay five pounds to sign up, you get free food and drink during the event and, if the weather is nice, you might even get to go for a paddle in the sea. For many years I've organised and taken part in tech challenge events of various kinds. I've watched them change lives. Come along in September and let this event change yours. Just press the button below. Today I went along to the Humber Care Tech Challenge Visioning Day. This is where we get healthcare professionals to tell us about their problems and explore how to solve them. It's how we are setting the agenda for the Humber Health Care Challenge event itself, which is running in September. During the event we want teams to come up with working prototypes of solutions. But to do that we need some idea of what we are facing. Your home should be a proactive part of your healthcare. People frequently interact with care services because they are lonely. People will tend to opt-out of automated systems if they think that they will reduce the amount of human contact that they have. We need to establish a culture that make people and families able to provide appropriate support to allow independent living for as long as possible. Say in your home. Stay in control. Stay in contact. We should strive to make it as easy as possible to deliver and monitor care, so that the carers have time to focus on the person, and not just perform support tasks. Shared records across agencies would be a great step forward in this regard. Lots of technology already in use can be used in a care context. It might just be a way of connecting things and re-purposing existing devices. We must plan for how the technology will be in 5-10 years time. Not what we can do now. When considering disability; you are not what has happened to you - you are what you choose to become. And you should be empowered and supported to make that journey. Machine Learning and Artificial Intelligence bring with them an incredible potential for healthcare. So do connected devices such as Amazon Echo. Very simple ideas can have a massive impact. After the talks everyone spent some time filling in idea cards that set out the challenges that they saw and ideas for addressing them. We're going to spend some time going through these and getting back to the delegates who proposed them to turn them into challenges for the event. Things are getting very interesting. If you want to take part (and you should) you can still sign up here. As part of the presentation we recorded a bit of video with me talking about the event and why it is a good idea. This is one of those occasions when everybody wins. Everyone who takes part will have fun, learn things and improve themselves. And they might end up creating a solution that change lives. The Humber Care Tech Challenge is a tech challenge about care that is based in the Humber region. Although I guess the title already tells you all that. It's in Bridlington in the lovely Spa Hall, and it is on the 5th and the 6th of September. Think of it as a hackathon with the focus on care. Teams will be able to work with healthcare professionals to create something life changing. With technologies such as LoRa coming over the horizon there's the potential for properly disruptive developments. 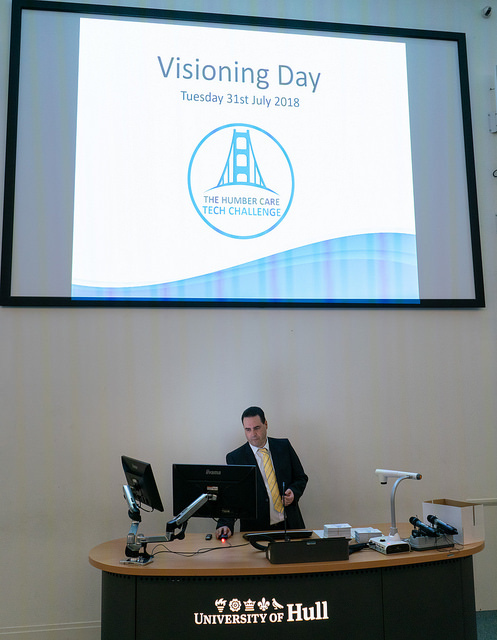 You can find out about the problems, the tech, and how to change the world, all in two days. .
We're having an "Visioning Day" at the University of Hull on the 31st of July where we want to put teams and problems together and start finding solutions. If you're good with software and/or hardware and want to spend some time making something interesting you should take part. If you do this as a hobby, we'd love to see you. It is also a wonderful way that teams of developers from a company can get together away from the office, learn some new tricks, prototype some products and get feedback from practitioners. Quite a few companies regard things like hackathons as great for team building and "blue sky" innovation. Think of it as an all expenses paid two days where you can focus on having fun and making stuff. Actually, it's not completely expenses paid - it costs five pounds per person to register - but after that your food and drink for the two days is free. And you can come to the Visioning Day day for free. There are some lovely prizes, including help to take ideas and make them into shipping products, but for me the journey itself is the biggest prize. I've been involved with development challenges and hackathons of one sort or another for the last 15 years and I've seen them add value to everyone who takes part. You can find our more, and sign up, here. You can find the challenge on Facebook here, and Twitter here.